1 A None No Power Seat 1 A may have restricted legroom as there is no cutout in the Bulkhead. There is no floor storage for this seat during take-off and landing. 1 C None No Power Seat 1 C may have restricted legroom as there is no cutout in the Bulkhead. There is no floor storage for this seat during take-off and landing. 1 D None No Power Seat 1 D may have restricted legroom as there is no cutout in the Bulkhead. There is no floor storage for this seat during take-off and landing. 12 D None No Power Seat 12 D is a standard Economy Class seat that is missing a window. 15 A None No Power Seat 15 A is a standard Economy Class seat, however this row has a misaligned window. 15 D None No Power Seat 15 D is a standard Economy Class seat, however this row has a misaligned window. 16 A None No Power Seat 16 A is a standard Economy Class seat, however this row has a misaligned window. 16 D None No Power Seat 16 D is a standard Economy Class seat, however this row has a misaligned window. 17 A None No Power Seat 17 A is a standard Economy Class seat, however this row has a misaligned window. 17 D None No Power Seat 17 D is a standard Economy Class seat, however this row has a misaligned window. 24 A None No Power Seat 24 A is in the last row of the plane and does not recline. The close proximity to the lavatory and galley may be bothersome. 24 B None No Power Seat 24 B is in the last row of the plane and does not recline. The close proximity to the lavatory and galley may be bothersome. 24 C None No Power Seat 24 C is in the last row of the plane and does not recline. The close proximity to the lavatory and galley may be bothersome. 24 D None No Power Seat 24 D is in the last row of the plane and does not recline. The close proximity to the lavatory and galley may be bothersome. 7 A None No Power Seat 7 A has extra legroom as the bulkhead is only a curtain divider. The tray table is in the armrest, making the armrest immovable. 7 B None No Power Seat 7 B has extra legroom as the bulkhead is only a curtain divider. The tray table is in the armrest, making the armrest immovable. The aisle curves just in front of this seat which may be bothersome. 7 C None No Power Seat 7 C has extra legroom as the bulkhead is only a curtain divider. The tray table is in the armrest, making the armrest immovable. 7 D None No Power Seat 7 D has extra legroom as the bulkhead is only a curtain divider. The tray table is in the armrest, making the armrest immovable. 9 A None No Power Seat 9 A is a standard Economy Plus seat that is missing a window. 9 B None No Power Seat 9 B is a standard Economy Plus seat. 9 C None No Power Seat 9 C is a standard Economy Plus seat. 9 D None No Power Seat 9 D is a standard Economy Plus seat. On all 170s United Airlines offers internet service for domestic US flights. Connectivity is available for laptops or mobile devices. The service is available once the aircraft reaches 10,000 feet cruising altitude. Click here for more information. This larger version of the Embraer regional jet is used for short-haul routes. Overhead compartments above seats D & F are much larger and can accommodate full sized carry-ons, where the left hand side bins are smaller. Window seats aboard this aircraft are reported to feel cramped due to the curvature of the plane. Economy Plus is offered on this aircraft type. Economy Plus is not a separate class of service but is standard economy with up to 3 inches of extra legroom. These seats are located nearer to the front of the aircraft and passengers in this section will be served first. Charges for these seats will depend on routing and may be purchased at the of booking or check-in. While SeatGuru lists this seat as yellow, there is probably 12-15 from my knees to the bulkhead. The seat is far enough away from the lav as to not cause an issue. IMO, not a yellow seat. The Embraer 170 is a comfortable aircraft for short, regional hops, such as my flight from Chicago O'Hare to Providence. While the interior seemed a little dated, the legroom was excellent for a two hour flight. The seats had enough padding, even more than the thin slimline seats that can be found on United's 787's. There was no entertainment, but what can you expect for such a short flight. I love the 2-2 configuration, leaving no one with a middle seat. However, as someone who likes to look out the window, nearly every seat in the E170 was misaligned. I either had to look over my shoulder into the window or lean far forward, not ideal. But, overall, if given the option, I would happily take this E170 again. Nice wide seats. LOTS of legroom but aisle angles in front of seat so can be a pain. Most uncomfortable plane ever. Yes, there is legroom but this is because the seats are shallow (not to mention hard plastic), so you will end up with sore aching legs and back if your flight is over 1 hour. This is a commuter plane and should NEVER be used for longer flights. The most miserable flight experience ever. The window for this seat is somewhat misaligned. 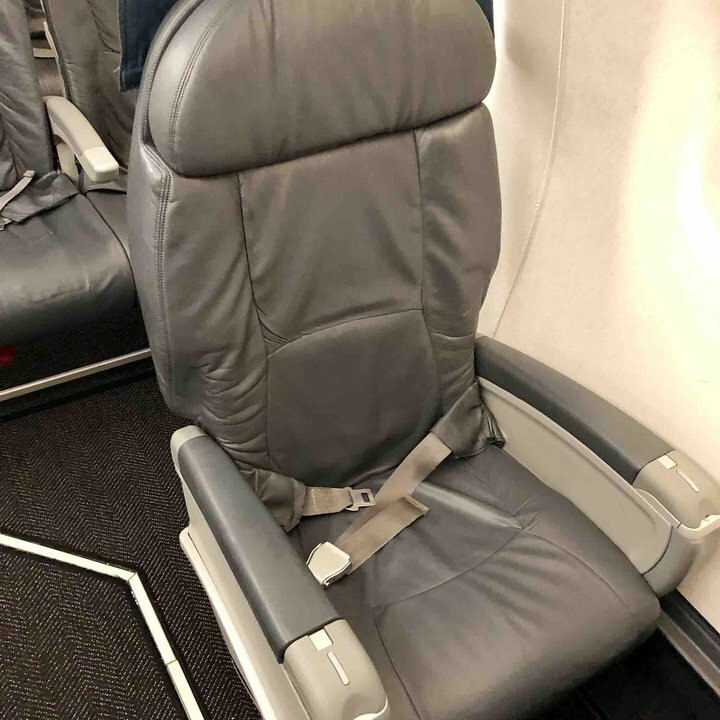 Not as bad as a completely misaligned seat but it is bothersome on a longer flight. The window with this seat is misaligned and makes for a narrower fit with the wall of the jet protruding into your shoulder. Most uncomfortable seats Ive ever had to endure for a flight thats 4-5 hours long. This aircraft is totally unsuitable for any flights longer than 2 hrs. Seat 1C is glorious on this plane with lots of legroom and full size overheads. There is no meal service but you get first choice of snacks. 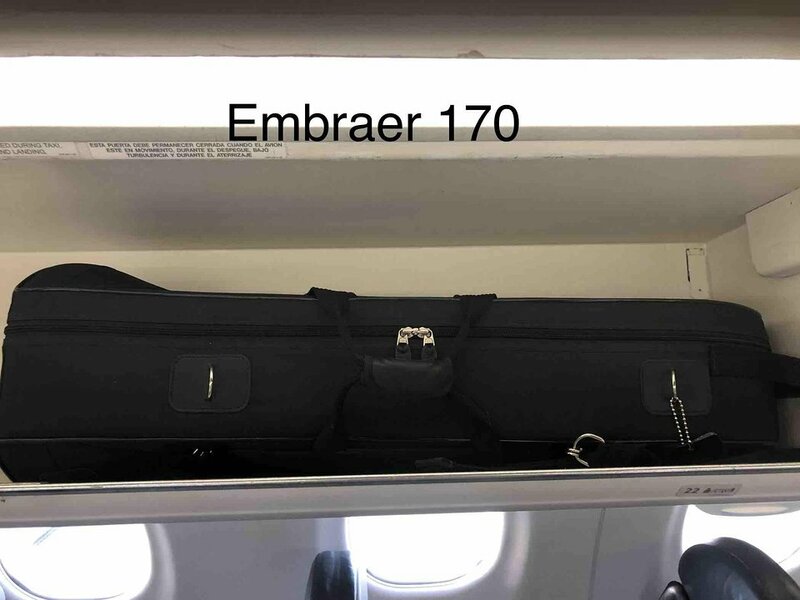 I flew on both configurations of the United Embraer 170 on my most recent trip. The first featured two rows of first class and newer, more modern seats. These seats were very uncomfortable and both my legs ended up falling asleep during the flight. The worst part was that the top of the seat is low and the headrest is not adjustable. I'm only 5'11" and if I tried to lean my head back to sleep I hit the plastic. On the second flight we were on the other variant which features 3 first class rows and older much more plush seats. These seats were much more comfortable and while the headrests were also not-adjustable, the padding extended higher and around the top, so sitting back and falling asleep was possible. I fly this aircraft between Denver and Columbus a few times each year, and always enjoy it. It is United Express operated by Republic Airways. The normal economy seats are spacious, and if you are lucky enough to get economy plus, get 7A, 7C, or 7D. These three seats have extra legroom plus storage underneath the seat (7B just has the former). Crews are friendly and will usually give you an extra snack if you ask for one. These two rows (7&8 seats A-D) do not have full size overhead storage directly above. This causes you to have to wait at landing to retrieve bags from storage a few rows back. 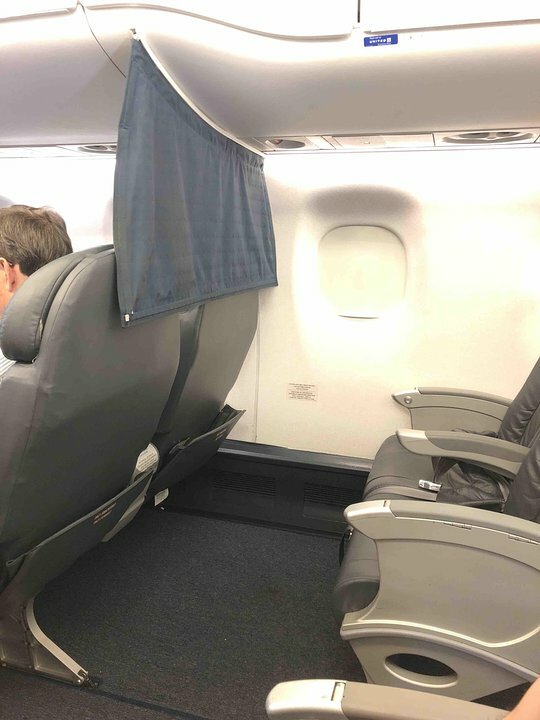 As with the windows seats in rows 15-17, the window seats in row 12 on United (SkyWest) EMB-170s are also badly misaligned with the window, making it very difficult to see out the window without craning one's neck to see out the window just over the shoulder. The major problem with this plane are two things. First of, the seats do not have head rests, the padding is very firm (which might be good for some), and the bottom cushion barely provides any support. Second of, this type of aircraft has a lot of maintenance issues. 2 days ago, I was on a flight from ORD to YYZ, and we left the gate on time, but we were still on a taxiway for an hour until the captain said that there was an electrical issue with the plane and we had to return to the gate (at 9:35 PM Central time). At 10:30 PM, we got boarded again (and yes, we have to bring back our carry-ons back on after being directed to take them out), and once we left the gate, the boarding door which was armed, opened for some unknown reason, and the captain said that the crew is uncomfortable taking the plane to Toronto, so I had to get to the wrong area to get my checked baggage because the crew gave out wrong information, and that it took them an hour to get checked bags up and ready for picking up. I also had to wait 2 hours in line to get $21 worth of food vouchers and a rebooking on a flight from ORD to EWR, and from EWR to YYZ. However, I didn't get offered a hotel voucher. But later (around 2 AM), worker for United have me another $21 of food vouchers and a free hotel voucher to the airport hotel (which is just a 3 min walk away). They also allowed me to take a 6 AM flight direct from ORD to YYZ via American Airlines, and I applaud those night shift workers for helping me get to my meeting as quick as possible. 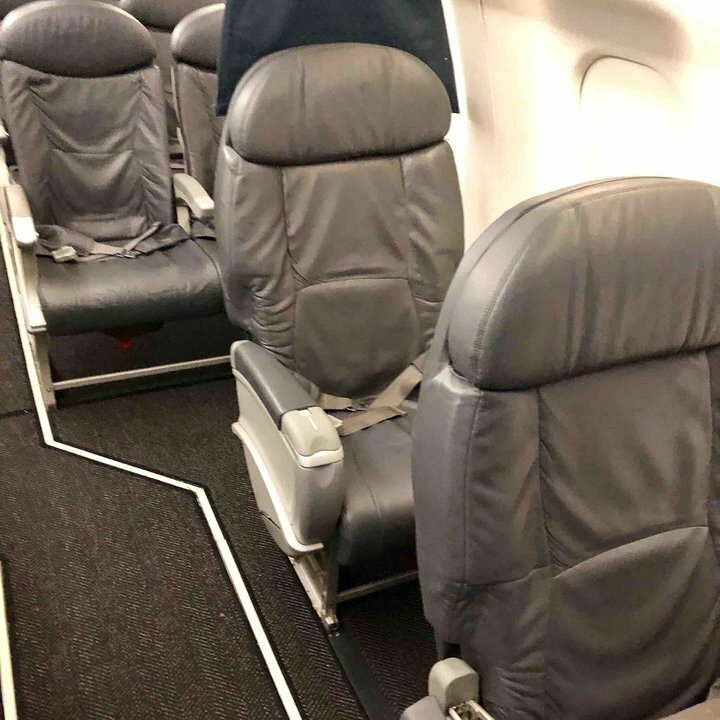 This is a great seat with extra leg room because of the dog leg in the aisle means a lot of people bounce their carry-on off you as they board. Gate check your carry on and board late. These first class seats are comfortably wide. Although there's only one window for each row, having the bathroom shared with only five other people, and the comfort of the seat, makes for a very pleasant flight. The overhead compartments above 1A and 2A are very small, but there's plenty of room in the overheads on the other side. The seat was much wider than normal economy seats on other jets, more comfortable and had more leg room. Plane was much smaller so less passengers, shorter lines and boarding process. Would take this plane everywhere if I could. Seats in row 7 have even more legroom than first class. Also, you may have to gate check large carry ons as the overhead bins are too small. Shuttle America (which operates UA's E170s) features very pleasant and attentive cabin service. 2A has restricted overhead storage; you'll need to use the bins across the aisle above 2C/D. I was not bothered by the coach seats immediately behind, although I understand if they were particularly chatty that might be distracting. All in all, a very comfortable regional jet. A good single seat, however the partition behind this seat is a mesh curtain, which does little to block out a 3 hour conversation between the folks behind you. 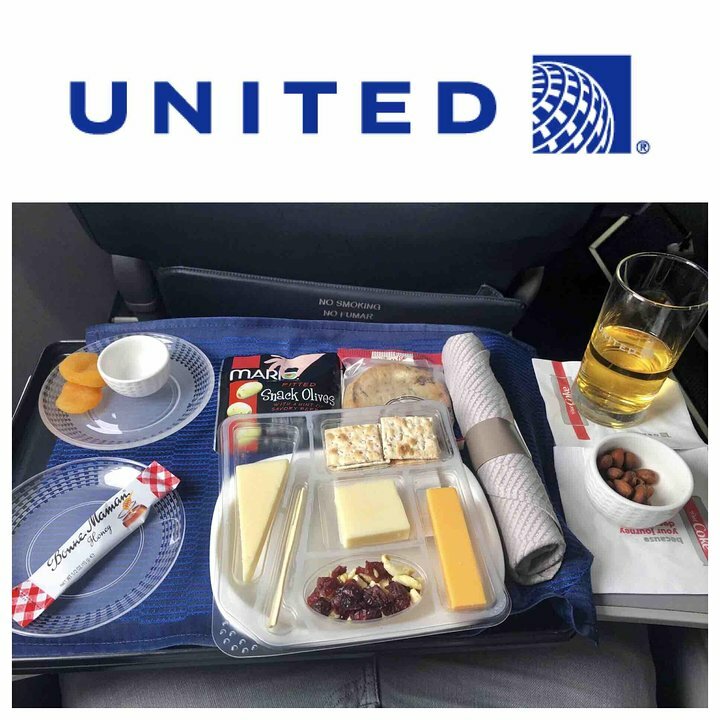 United flies 1 versions of EMB 170.